I am very much a newcomer to digital video filming and editing. 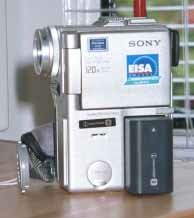 In March 1999 I purchased my first video camera, a Sony DCR-PC1E mini digital video camcorder (DV in enabled). I did not realise when I bought my camera in Asia what a sensible decision this was for a future computer editor, since the camera had not been nEUtered for sale in the European Union (the case with versions of this model sold in the EU). In other words, I was able to record my first short film directly from my computer on to mini-DV tape in my camcorder and then onto VHS format video film without first having to purchase any enabling widget. I made the decision after purchase of the DV camcorder that I was going to aim to computer-edit my films. A decision which was made with no understanding or conception of the trials and tribulations of computer editing - in particular the hardware problems of assembling your own editing machine - and having no friends or acquaintances who had ventured down this stony road! My next rash decision was to invest in a new computer specifically aimed at video editing. At that time I was not subscribing to any computer video editing magazine and nor had I found any good web sites on the topic! Madness to leap in the dark, which was what I did! See Computing for information on the trial and tribulations of getting a stable and supported video editing computer. I certainly seemed to learn more about computer hardware assembly and (in)compatibility problems than I ever did about video editing! So far I have taken footage in Sarawak and Sabah, East Malaysia; Kuala Lumpur, West Malaysia; Hong Kong; Japan; Mexico; and several hours of footage in south west China in 2000 and 2001 featuring ethnic minorities and their costume and textile skills.